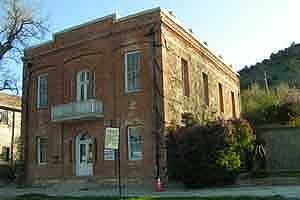 The Million Dollar Court House, Pioche. In the 1870s Pioche was so remote, violent and bloody that it was reknowned as the toughest town in the west. 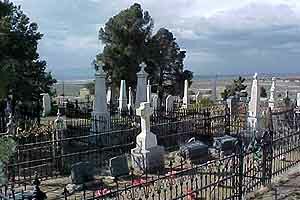 More than 60% of the 1871-1872 homicides in Nevada happened in and around Pioche. Silver mines operated here from the 1860s through the 1960s, with ups from 1869-1876, 1912-1930 and 1937-1957, and downs the rest of the time. The Number 1 Mine was the last to operate, closing for good in 1969. 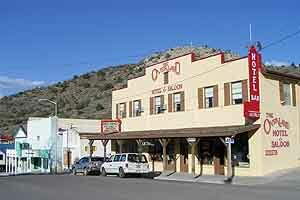 The Overland Hotel in Pioche has been completely renovated and refurbished by owners Ron and Candice Mortenson. 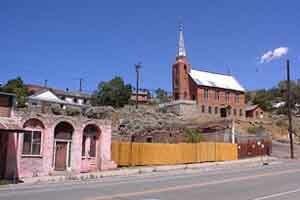 More recently Pioche was discovered in the 1990s by a wave of entrepreneurial explorers from Las Vegas. These pioneers had found a treasure, this down-at-the-heels old mining city with the flamboyant past. They bought empty and struggling stores on Main Street, cleaned them, painted them and put bright new businesses in them. And then they slowly starved to death waiting for customers to appear. Despite being only three hours from Las Vegas and located in a region of state parks and magnificent landscapes, Pioche isnt overflowing with weekenders from Las Vegas. How can this be? Maybe Las Vegas is a jealous mistress, and won’t allow fond thoughts of other places. And Las Vegas is ever so much tougher and more violent than old Pioche ever was, so maybe there’s just no appeal on that level. There’s a mountain near Pioche called Highland Peak, and I’m told that on a clear day you can stand at its summit and see Mt. Charleston far to the southwest, and Wheeler Peak far to the northeast. Essentially you’re seeing from California to Utah. I will see it for myself next trip. The drive from Pioche to Baker is only a couple of hours, plenty of time to fall into a reverie as you slowly transit the valley at the western foot of the Snake Range. 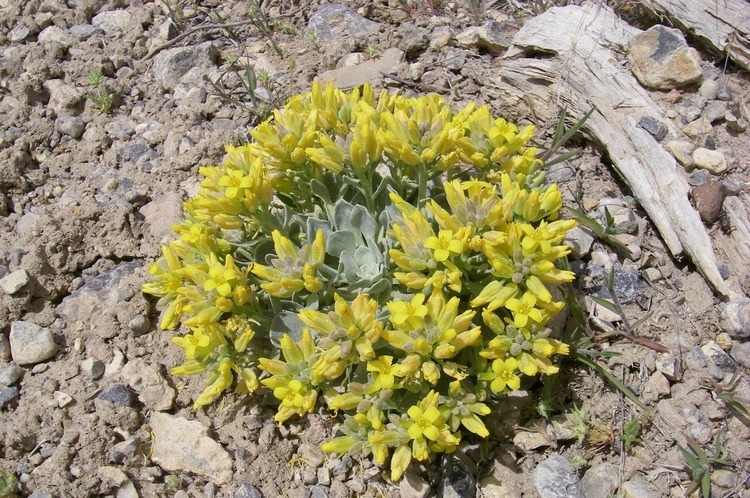 Great Basin National Park is centered on those mountain summits, but the entrance is around on the east side. At the junction with US 50/US 6, Majors’ Place is closed up tight, like most of the little enterprises, from roadhouses to gas stations, that once flourished at every crossroad. A part of the Permanent Wave Society display on the entrance road from Baker to Great Basin National Park. Sad report from Baker: Doc Sherman, founder of the Society and progenitor of the art displays has passed away. His art is clearly not immortal either; it’s looking a little the worse for wear, but it survives. Not long ago someone took the skull from The Horse with No Name and it seemed as if the art that Doc had inspired by his own creative example would pass away with him. But now the skull has been replaced, and the horse is whole again. Maybe there will be a new piece or two along the fence line when you make the trip. 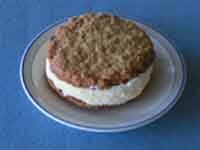 The famous ice cream sandwich at the Lehman Caves Cafe; it will feed a family of four. Sadly too, The Outlaw remains closed, but the food at the Lehman Caves Cafe at the Park’s Visitor Center is excellent, and the Border Inn serves hearty fare from 6 am to 10 pm. Great Basin National Park is the main attraction, but Baker is an attraction in its own right, a pleasant unassuming little burg with interesting people putting out the welcome mat for visitors. Lodgings available. Owner Ronnie Branham of The Steptoe Valley Inn. The beautifully conceived Steptoe Valley Inn has re-opened just up the street from the Ghost Train Depot. Norm and Jane Lindley made this humble mercantile building into a jewel-box, and new owner Ronnie Branham is realizing a dream. She learned to bake out at the ranch, and now her guests awaken to the aroma of fresh baked bread and pastries. She sells 60 cinnamon buns every morning, and Ely is that much more civilized as a result. Eureka is still as sunny and inviting as ever, but my schedule only permitted a brief stop at the Eureka Opera House to check out the permanent exhibit by Visiting Artists. It’s a small treasure and if you’re lucky, Curator Wally Cuchine will find a few minutes to give you his personal tour of these beguiling art works. St. Augustine’s Catholic Church hovers above Austin’s Main Street. Austin is showing increasing signs of life, maybe not altogether appropriate for a ghost town. The gaunt old city, clinging grimly to its mountainside through a hundred years of decline, is attracting new residents, new energy, even a little new money. The historic business block where Carol’s Country Kitchen once served dinners that made Austin famous, is now Main Street Shops. Owner Jan Morrison offers an eclectic variety of goods to the passing world, with a view to historical interest. Patsy Waits operates the multifaceted enterprise in the old Lombardo Turquoise building (the blue one) at the top of town. 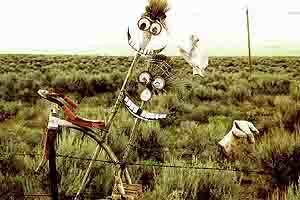 She “inherited” the T-Rix bicycle business from her son as he began forging the bicycle shop empire he commands today from Elko. She has added any number of new products, from bath salts to (blessedly!) espresso coffee in all its modern self-indulgence. The Austin Cemetery at the mouth of Pony Canyon. The Toiyabe Cafe on the upper slope of Main Street has a well-deserved reputation for good food, professionally prepared and cheerfully served.The International Hotel down the hill is the other choice for food. Best of all, coffee is available here a little after 4 am, breakfast comes a little later. The Trading Post is a surprisingly sumptuous jewelry and gift shop, and there are other shops with jewelry and artifacts for sale. 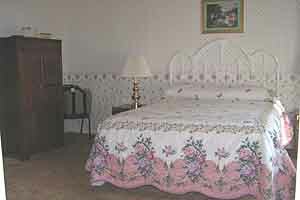 I stayed at the Lincoln Motel across from the International Hotel, one of several modest lodgings available at a modest price. Austin is a pleasant place to break your trip down US 50, particularly if you allow two or three hours for exploring its steep and tangled streets.